from an afternoon fishing trip in Louisiana. DeKalb Scouts enjoyed an adventure with long but unforgettable days paddling canoes more 60 miles through the Atchafalaya Swamp, which extends more than 1.4 million acres across Louisiana. Boy Scout Troop 33, chartered by First Lutheran Church in DeKalb, sent 13 members on this nine-day summer high adventure canoe trip. Scouts canoed across open swampland and into dense areas paddling past 1,000-year-old Cypress trees. Each day took them deeper into a totally new kind of wilderness unlike anything they’d experienced before. Swamp portages involved crossing land areas moving canoes, food and equipment. The most famous portage, known as “Swamp Tromp,” became a messy, muddy challenge that required a lot of teamwork from the scouts. A swim afterwards was necessary just to wash off all the mud that covered them. Wildlife included aquatic birds, poisonous water snakes, plus 25 alligator sightings as they paddled through the swamp. Camping on soft ground didn’t involve tents. Instead they slept in canopied hammocks stretched between trees, a rustic cabin, and one place where no land was available, they spent overnight aboard old houseboats. 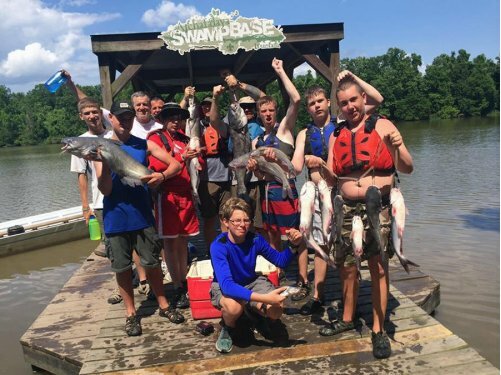 In the heart of Cajun country, scouts enjoyed a unique variety of activities such as a blowgun tournament, a thrilling airboat ride, stand-up paddle boarding, some swamp swimming, and great fishing where the biggest catch was a 25-pound catfish. Cooking meals with Cajun recipes became a special treat. They also learned about the wetlands, local cultures and ecological conservation. The 13 who conquered the swamp included 10 scouts -- Hank Barnes, Bryce Comer, Keegan Donnelly, Hunter Jensen, Caeden Keith, Ryan McNett, Jack Petrie, Brandon Radtke, Seth Wickens-Walther and Aiden Witthoff -- plus three adult leaders, Cohen Barnes, Chad McNett and Steve Radtke. Swim training with DeKalb Park District and a canoe trip on the Hennepin Canal helped prepare them for the trip. Learn more about Troop 33 online at www.troop33dekalb.net.